BL Berry grew up telling lies. Eventually, those lies turned into elaborate stories and when she grew older she started writing them down. When she’s not hiding behind her computer writing, you can find her spending time with her family or catching up on her favorite TV shows. Rumor has it she’ll sleep when she’s dead. 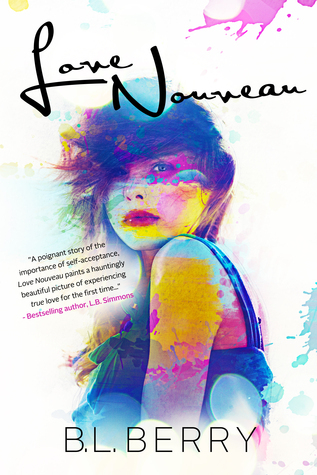 Love Nouveau is a beautifully written new adult novel that rocked my heart and soul. It details the budding relationship (complete with sweet romance, passion and pitfalls) between Ivy and Phoenix. Right before Ivy is about to choose her post-college path, she meets Phoenix, and they are instantly attracted to each other. The inexplicable attraction is totally believable. It’s the kind that makes you feel like you NEED to be near someone, an undeniable connection that MUST be explored. It’s the beginning of young love. *sigh* Before you know it, Ivy and Phoenix become emotionally involved with one another, communicating largely via text and phone conversations. However, given Ivy’s past mistakes and the way she is used to being treated by her mom and sister, she is weary of allowing Phoenix into her heart. The characters in this story are all flawed in some way. A few make terrible decisions and some choose to grow and change, just like in real life. Something else I love about this story is the way Berry scattered poignant insights throughout. There were times when I reread portions just to soak in the words. If you like stories centered around young, can’t-live-without-you love and can appreciate a few twists and turns that get in the way of the HEA you’re hoping for, then you should give this book a shot. I will definitely be reading part two: Love Abstract. Disclosure: I attended a book signing a few months ago in Waterloo, Iowa, where I picked up an autographed copy of Love Nouveau and had the pleasure of meeting B.L. Berry. My opinion of this book has absolutely nothing to do with the fact that she is an absolute gem.